What’s that? It’s the beating heart of The Shape of Water. Last night, Guillermo del Toro’s The Shape of Water became the first science fiction film to win the Academy Award for Best Picture. And whether you believe the film deserved the award or not, it was a landmark moment for genre films. To celebrate the victory, we’ve gone back through our archives to see where The Shape of Water began, where it went, and so much more. Whenever a popular filmmaker releases a movie, the question is always “What’s next?” So we’ll start with Crimson Peak, del Toro’s last film, released in October 2015. Here’s our review; the path to The Shape of Water began right here. In May of 2016, the title The Shape of Water first popped up on our site, tied to the casting of Michael Shannon in the film. What Are the Chances of Deadpool Appearing in the X-Men Movies? A few months later, in August 2016, del Toro announced that he was going into production on the movie. In January 2017, the first real details about the film were released. In an interview, star Doug Jones explained the setting and how his creature would fit into the movie. Read that below. Seven long months passed since Jones’ interview, as del Toro likely worked on and finished the film. Then, finally, in July 2017, our first look at The Shape of Water finally arrived. The first inkling that del Toro had something special on his hands came in late August of 2017. The Shape of Water had its world premiere at the Venice Film Festival and the reviews were stellar. Now that people had seen the movie, details about just how weird it was started to leak out. And, well, this one kind of says it all. The marketing continued on its way to release, including this second trailer. The Shape of Water looks much more expensive than it actually was. Reportedly, it cost around $20 million and, in a Q&A, del Toro explained how he stretched that budget to its limits. Finally, on December 1, 2017, The Shape of Water was released, right in the heart of awards season. Here’s our review. Since we loved the movie, we decided to dig a bit more into it. For example, the movie was written in tandem with a book that’s very different from the movie. So, below, read the real origin of the film, from an author named Daniel Kraus, as well as an excerpt from his book. Weird stories about the set started to come out. At the press junket for the film, io9 spoke to del Toro himself about the film’s mythology and creature, and he was happy to tell us about it. With its great reviews, The Shape of Water became an awards contender. So we made sure our coverage appropriately reflected the film’s prestige. Winning awards from various critics groups, The Shape of Water started to pick up some momentum. It culminated with a victory for Best Director at the Golden Globes. It didn’t win Best Picture there, but it was obvious that the movie had its fans. And yet, it was a little surprising that when Oscar nominations came out on January 23, The Shape of Water had more than any other film—13 total, cementing it as a favorite. After its Oscar noms, The Shape of Water’s profile was higher than ever, and with that came accusations of plagiarism. Del Toro has denied them but people began to wonder if that would hurt its Oscar chances. The most important mystery of the movie is solved. The second most important mystery of the movie is solved. And that’s when it became the best movie of 2017. This is not at all what we expected when del Toro first announced the film, or even when we saw it for ourselves. 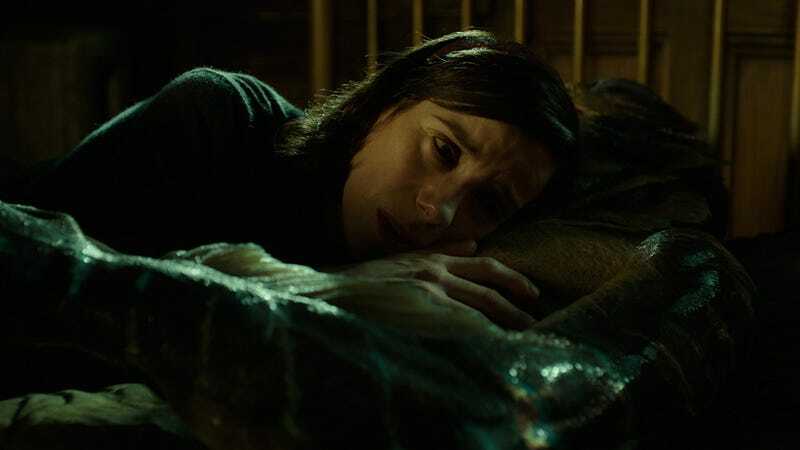 The relationship between Sally Hawkins’ Eliza and Doug Jones’ amphibian man may have been an unlikely romance, but the Academy’s celebration of this otherworldly love story was even more so. Still, it couldn’t have happened to a nicer fish-creature.